Quick and simple blueberry cashew smoothie for breakfast. At my last acupuncture session, I realized just how little I was eating and promised my acupuncturist at Two Tiger Acupuncture (these guys are amazing) that I would make a much greater effort to eat three meals a day and go to bed earlier. In the three days since, I’ve eaten more in those 72 hours than in the entire week prior. As a proclaimed breakfast hater, I needed to find foods that I wouldn’t just make and stare at from a distance. I was on a mission to find seven tasty foods that were quick and easy to make and that I wouldn’t mind having on a weekly basis. The Booby Boosting Dark Chocolate and Cherry Oatmeal quickly took up that first spot. I loved the Nutella French Toast Sandwiches, but I was searching for something a tad more nutritious than bread and chocolate. 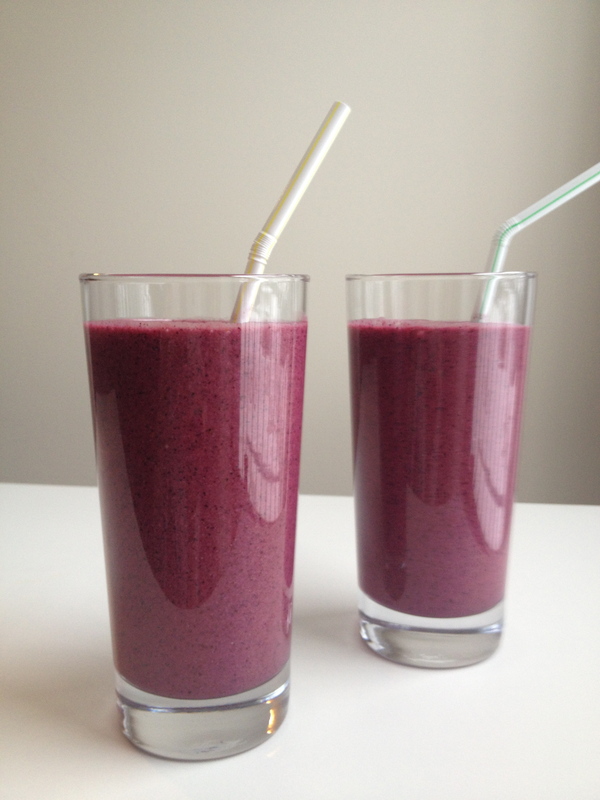 Then it hit me–SMOOTHIES!!! I love a good smoothie. Not only do they fit the super quick & easy to make category, but they are easy to drink while I’m busy with a five month old, and as a BONUS do not, in any way shape or form, represent a traditional breakfast. They can also be packed full of nutrients, and this refreshing Blueberry Cashew Smoothie is no exception. The Vita Mix is my go to blender. I’ve had it for 4 years and it is an absolute dream. It will literally pulverize anything you put in and clean up is all of one minute – I kid you not. If you are planning on making baby food, you may want to invest in a Vita Mix instead of a bullet or baby blender as it is extremely powerful and can be used to create so many different types of food (soups, smoothies, sauces, spices, coffee, flours, etc). I even use it to make household and baby products because it chops herbs up so finely. You cannot go wrong with adding this piece of equipment to your kitchen. Enough about the Vita Mix. You can use a regular blender, but you absolutely must soak the cashews first or you will end up with a ‘Chunkie’, not a ‘Smoothie’. I’m including this smoothie as a supply booster with one caveat–I’m not positive on the blueberries. The monounsaturated fats in cashews are definitely a supply booster as they increase the richness of your milk. As for the blueberries, the research I’ve come across says that they are a great food for nursing moms because they are packed with nutrition (high in vitamins K & C, manganese, antioxidants, omega 3 fats, & fiber. Contains vitamin A, potassium & calcium) and that these vitamins and minerals boost lactation. However, the bilberry–a close relative of the blueberry–has been thought to be a lactation suppressant. If anyone knows anything about which way the blueberry falls, please let me know. Layer all ingredients (except for ice) in a blender starting with liquids, then fresh ingredients, then frozen ones. Blend on high until smooth. Taste and add more maple syrup and/or ice as necessary and pulverize. Serve immediately and check for blueberries in your teeth before smiling.